All credit for my user pic goes to the incredibly talented Youkai Yume! Nominated by the great Hair-chan!!! Made by Sesshomaru's Secret Admirer! K I want to put this here while I am remembering it... I use the Gimp program to draw and these are a list of the brushes I may use from time to time...want to make sure they get credit if I forget when I post any art!...lol...kk here they are! 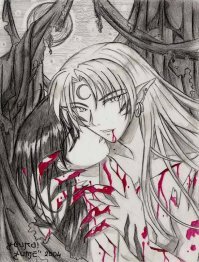 Sesshoumaru has an addiction, but he isn't willing to admit it...so in order to save her mate Kagome has to play a dirty trick and sabotage his addiction to get him to see the truth. Written for the '2nd annual 50 Ways to Torture a Taiyoukai' challenge. She was turned into a vampire against her will, now she must adjust to the way her life has changed, she walks in the day but must feed at night. She searches for love, in the hopes everything will be alright. This was originally part of a collaborative effort between several authors that recently fell through. Kagome gets revenge on Sesshoumaru in a very sweet way. A variation on D/D in chat. Everyone who was active threw me two prompts, and once I had them all, I had ten minutes to throw out a 100 word reply incorporating all of the prompts. This is the result. Written in the 18+ room so no minors please. A corrupted version of 'Twas the Night Before Christmas.' A gift for my beloved twin Duchess of Darkness! Thank you for the review! I'm not sure where exactly it's going lol I do have some ideas though. 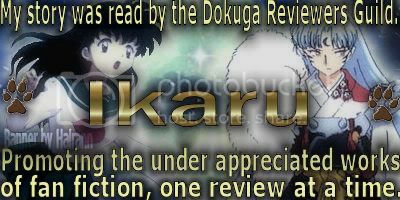 Thank you for your review of my story 'Haunting of Sesshoumaru'. -bows- Yeah I put his father because out of all of them he seems to be the one to do it lol, and ^-~ Kagome possibly did have something to do with it lol. Thanks for reviewing The Haunting of the Manor and hearing that it had a Poe feel to it is a huge complement for me. He's actually one of my favorite authors and one I strive to write 'like'. Glad you enjoyed it . 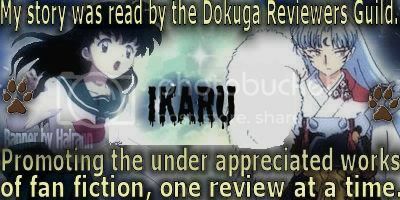 Thanks for reviewing Kagome Doll Ikaru-chan, glad you enjoyed it . Glad you enjoyed it and not sure if you caught it before you left chat, I've decided to do them weekly on Mondays at 6 EST .